What is the need for the doctor’s signature on the consent form? Dr. MC Gupta, a legal expert, explains why a doctor’s signature is necessary on the patient consent form. Patient consent is one of the critical issues in medical treatment.If a medical practitioner attempts to treat a person without valid consent, then he will be liable under both tort and criminal law. 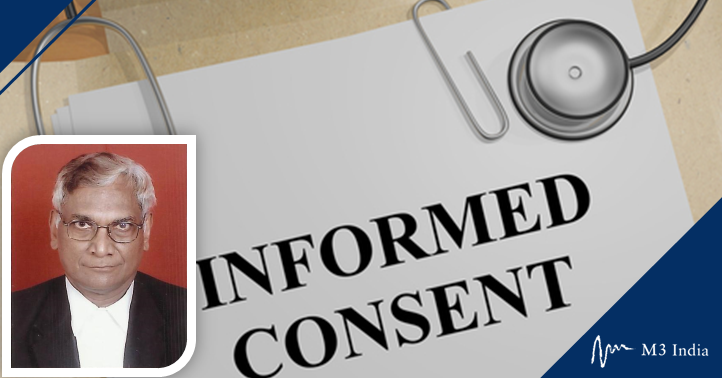 The process of informed consent is usually formally documented by the reading and signing by both patient and clinician of a ‘consent form’. But a question may arise as to why is it important for a doctor to sign this patient consent form. Legally speaking, what is the need for the doctor’s signature on the consent form? Isn't it a unilateral declaration by a competent person (patient) after counselling? 1. If consent is deemed to be a part of the contract, then all parts of the contract must be signed by both parties. A contract with several parts will be invalid if one of the parts is not signed. 2. If consent is a declaration by the patient after counseling, then it must be certified by the doctor under his signature that he has done such counselling. As a matter of fact, it is not a unilateral declaration. A contract / part of contract can never be unilateral. 3. Courts have held that consent must be informed consent. A consent without proper information would be invalid. Proper information has to come from the doctor himself. Hence his signature on the consent form is a must. Content from the writer has been directly replicated on the website. No edits have been made.